Van asked if there were must-eat dishes in Singapore. While there are several, it’s difficult to introduce them all in one go, and after a week melting in the heat of the city, I think aircon is a must-have wherever we eat. 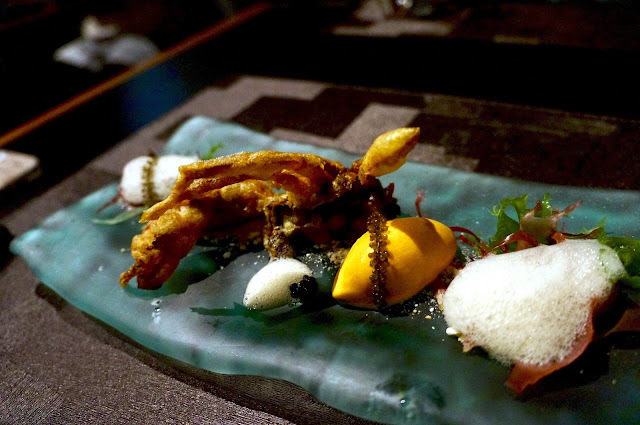 Labyrinth serves modern innovative Singaporean cuisine in the Esplanade Mall. Chef Han instils French cooking techniques and fine western ingredients into a range of traditional dishes, arranged them from the first meal of the day to supper. There was a 10-course discovery menu, with the option of 3 additional courses, or the full blown 15-course experience menu. We went for the full experience. I don’t recall being served bread. A tingkat tray is an old-fashioned multi-tier, metallic lunchbox. 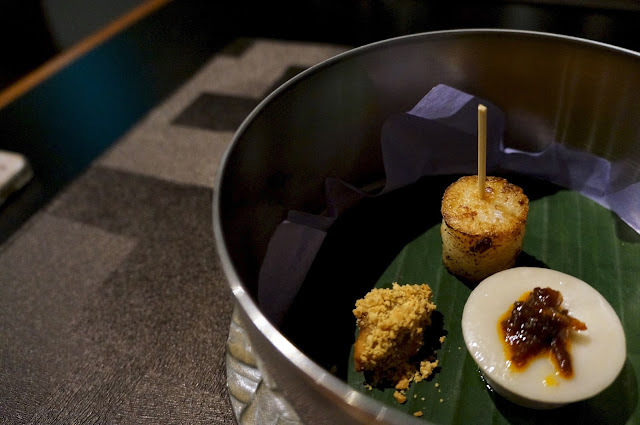 The turnip cake on stick was an interpretation of chai tau kway, with the texture of toasted marshmallow with a slightly crispy shell and a soft centre with dried shrimps and scallops. The nasi lemak chwee kueh (water rice cake) had faint traces of coconut milk fragrance, topped with spicy fried dried anchovies. The mini-rojak was a fritter holding in a small sac of sweet and tangy sauce. The little creations were a great start to the meal. 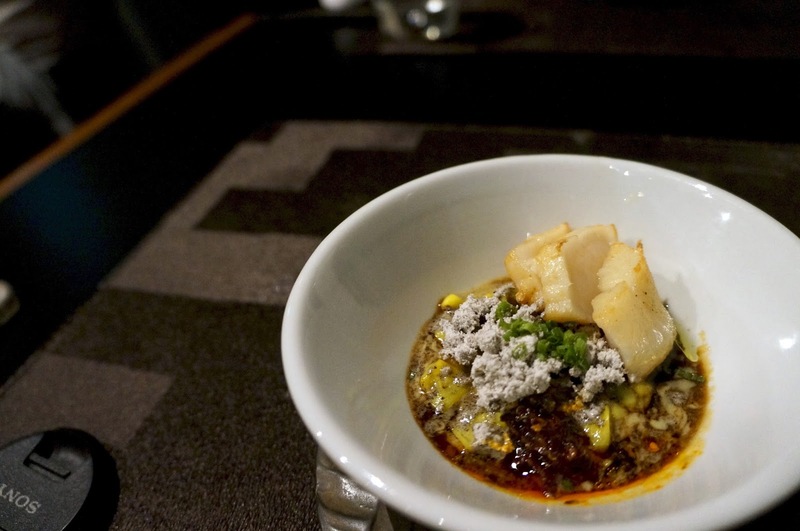 The spring noodles were made up of strips of squid infused with saffron to give it a yellow glow; the fish cake was replaced with Hokkaido scallops that were flash-fried, which retained the creaminess of raw scallop with a rim of oceanic smokiness. The olive and anchovies powder was an imitation of the minced pork added a powerful pungency, finished with black Chinese vinegar and a blob of dried shrimp sambal. This posh version of bak chor mee definitely beats the traditional one. We were told by our server that this chicken rice had no chicken and no rice, it was small cube of Japanese tofu, infused with the soup base used for chicken rice, topped with grated ginger. The chicken rice flavour was almost undetectable, it was just a tiny bit of silken tofu with the ginger and spring onion dip usually served with steamed chicken. It was a bit naf. This was chef’s interpretation of the iconic roast pork and roast pork belly rice. The tuna belly nigiri was glazed with char siew sauce, and the cube of translucent pinkish o-toro sashimi seared on one side, topped with a crispy pork crackling. Therefore replacing fatty pork with the finer tuna belly. 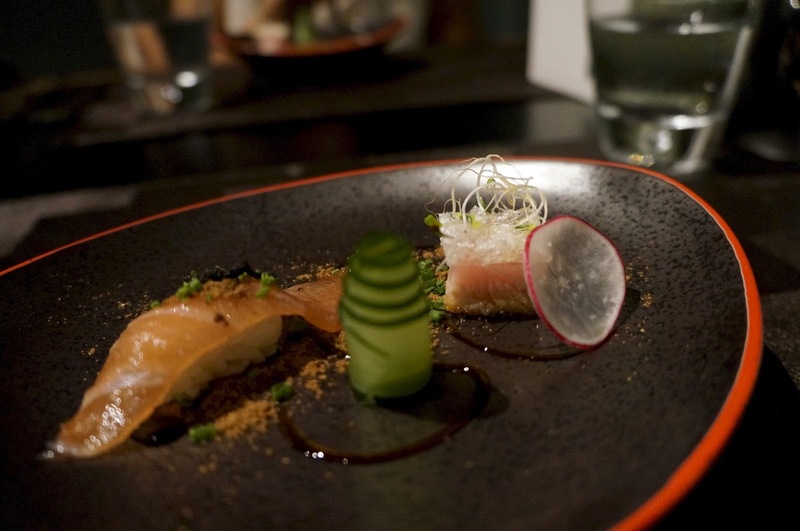 The char siew sauce was too sweet for the nigiri, overpowering the exquisite flavours of the oils from the tuna belly; a bit wasteful and reckless - would have achieved the same effect with torched salmon belly. we agreed the cucumber was way too sugary, and did very little to cleanse our palate - perhaps consider a ponzu marinade? The sashimi worked much better as the tuna melted in mouth and the oils seeped through to the fragile crackling. I really appreciate the idea of the dish, maybe it just needs slight modification to balance things out. 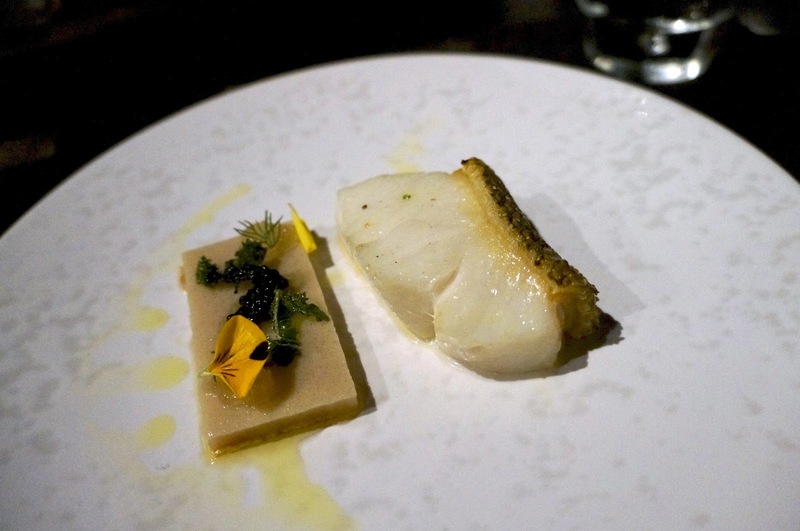 The muscular cod fillet was perfectly undercooked to retain its succulence and silky soft texture, with a brittle skin. The highlight, however, was the gelatinised fish bone parcel on the left, bursting with umami. 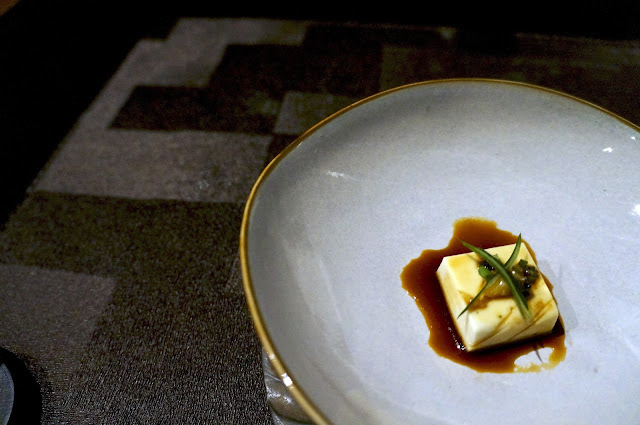 Seeing fish head is a Singapore signature dish but not many visitors are fond of devouring a massive floating fish head, Chef had cleverly extracted all the goodness from the giant fish head, and repackaged it into a beautiful sheet without losing the slithery textures. Not something I had the heart to tell Van during the meal, since she really enjoyed it. 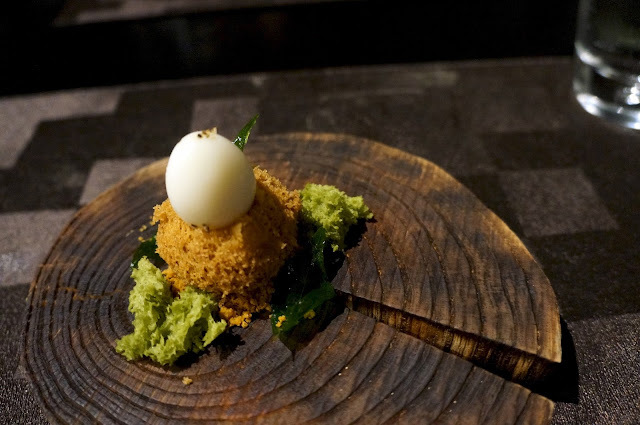 The deconstructed curry puff had a potato base enveloping a small bite of chicken, wrapped in a spice-infused crumbly shell and topped with a hard boiled quail egg. Though the curry spices were aromatic and prominent, the ensemble felt quite dry, especially with the addition of dehydrated crumbs at the bottom. Maybe leave the quail egg soft-boiled, then the runny yolk could moisten the harshness, or inject some curry sauce in the croquette. 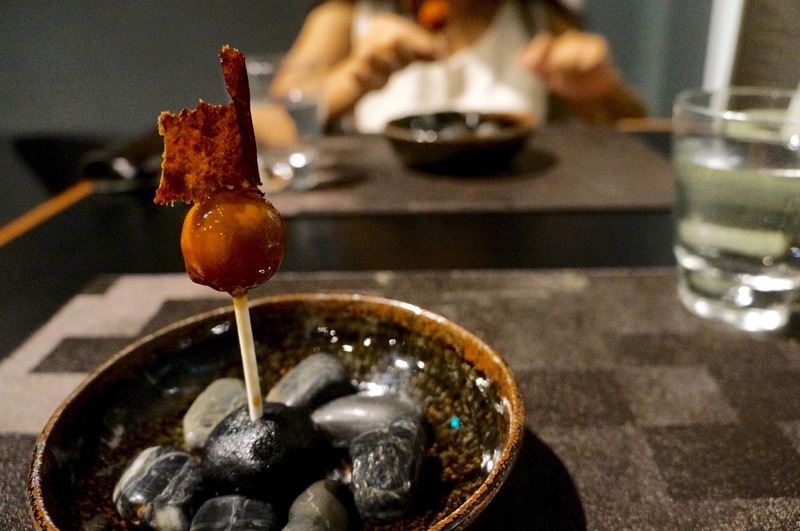 The lollipop of the foie gras was coated with hoi sin sauce, crowned with a sheet of wafer thin duck skin. The globule of duck liver slowly melted to mingle with the sweet sauce, my mind was briefly tricked to believe I was having peking duck, but soon the richness took over, and it wasn’t long before I was aware I had a cold lump of buttery foie gras in my mouth… melting away to the core, revealing a…*drum roll*…. lump of cucumber… huh?! I get it, we have cucumber and spring onion strips with our peking duck pancakes, but there is something decidedly wrong about mixing liver and cucumber together; it’s water and oil. Again the concept of the dish is ingenious, it might just need something else to cut through the weighty foie gras, or even a ball of duck with a foie gras centre and cucumber ice shaving on the outside - just keep the liver and cucumber separate. 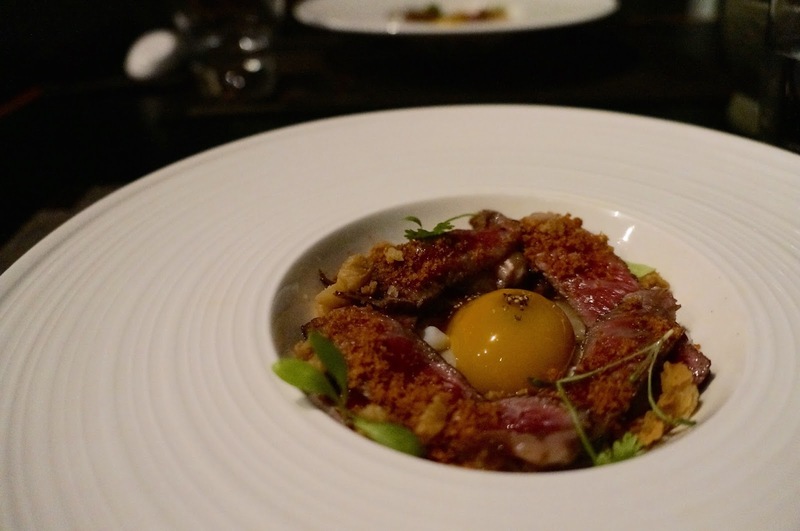 I had high expectation of the signature dish of Labyrinth, and it did not disappoint. There were two flavours of ice cream, chilli crab and black pepper crab, recommended to be eaten separately. The chilli crab ice cream boasts intense sweet tomato essence with a short but impactful spicy kick; the black pepper ice cream was piquant and mildly bitter, I thought I could taste a faint trace of coffee. Both flavours worked wonders with the light and crispy soft shell crab, created an explosion of flavours and playful textures. A sophisticated creation. Initially I thought the yolk was looking unhealthy, turns out it was injected with gravy sauce, which lightly cooked the yolk from within before the custardy runny egg poured all over the silky hor fun. The strips of A4 grade Wagyu from Ohmi were grilled to a stunning medium-rare with a ruby centre. I usually prefer Wagyu cooked to medium for the fat to melt through, but this medium-rare worked fine in thin slices, as its beefy goodness was unleashed with every chew. The meat was soft and tender, oozing bovine fragrance from the dissolving marbled grease. I thought the hor fun (flat rice noodles) was a mixture of real hor fun and sheets of cuttlefish, I can’t be sure – maybe the kitchen was that good. This was the biggest let-down of the evening. The coal pieces on the left was set alight after the dish arrived, and all I could smell was alcohol – before, during and after – it was burnt out. The black log of eggplant had no seasoning except for the slight bitterness from the burnt skin. The coal, the burning, the blackness add nothing to the dish. This one needs re-working. 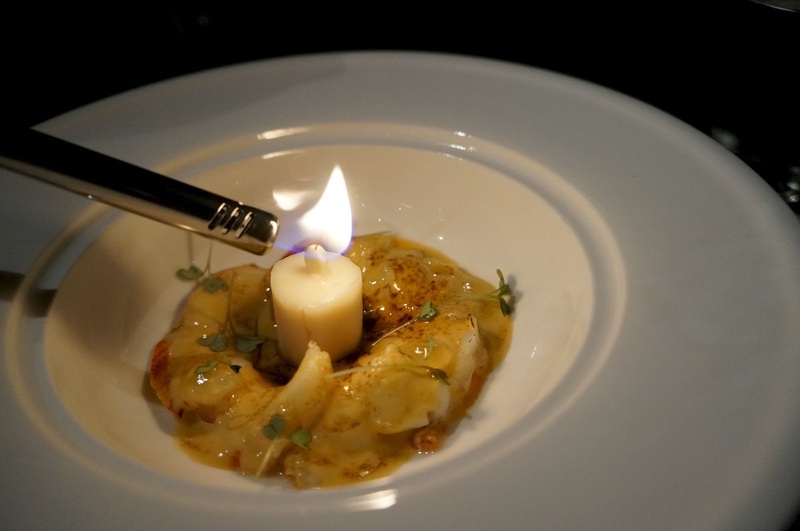 This understated noodle dish was given an uplift with generous chunks of bouncy lobster and a lard candle, which reminded me of the beef fat candle in Restaurant Story; similarly they both felt somewhat redundant. That said there’s nothing the muscular lobster meat can’t save. The sauce was robust and deep, brimming with the crustacean roe and goodness from the lobster head. This is another signature of Labyrinth. 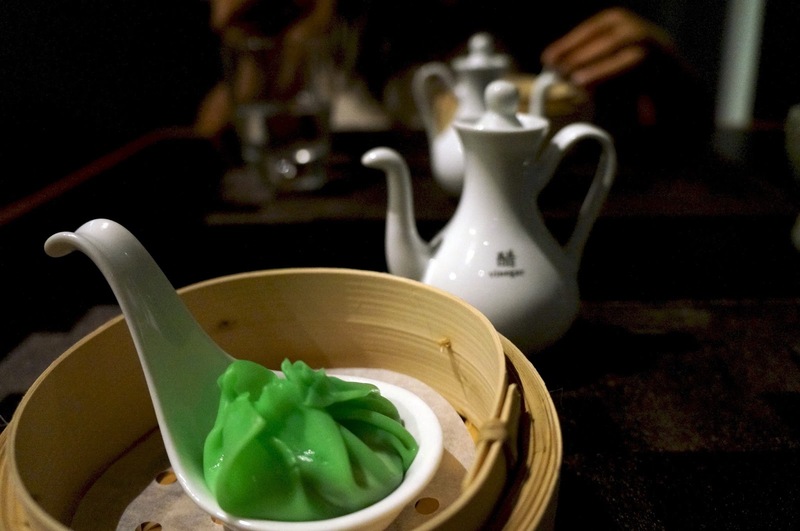 The pandan-infused dumpling skin holds a mini chendol: a small sac of coconut milk, sweetened red beans and a little lump of shaved ice. Like typical XLB, the explosion in mouth was immensely satisfying. I’m not a fan of the gula melaka syrup in the vinegar pot, but visually it completes the picture. 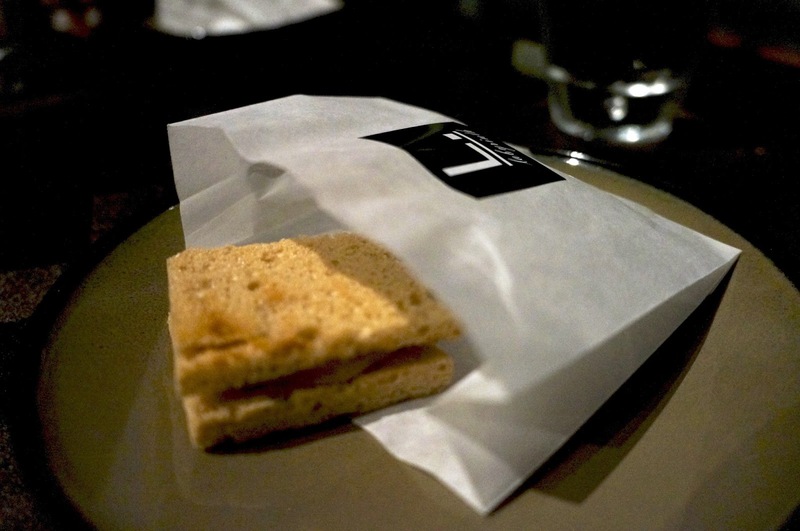 The airy meringue was griddled to look like toast, served with a smooth layer of teh tarik flavoured kaya. What’s not to like? This was most impressive. Our server cracked open our soft boiled egg at our table, to release a coconut panna cotta with mango puree. With a drizzle of black sesame sauce and a sprinkle of grounded black sesame, it looked exactly like the local breakfast! Should have saved some toast from the previous course. The “macaron” took after kaya toast. I could see Van wincing as she bit into the thick disc of butter sandwiched between the two cookies. Usually I remove the brick of butter in my kaya toast; if it’s too thick for the toast to melt, it’s too much for my body to digest. The real locals, however, devour it. Having a block of butter with toast is debatably acceptable, but that much butter with two small discs of cookie / biscuit (FYI it’s definitely not a macaron) is downright wrong. I would have preferred an old-fashioned macaron with kaya crème filling. It’s an incredibly ambitious menu, considering out of the 13 courses, there was very little repetition of ingredients. Each course, though petite, could stand on their own with depth and structure in flavour. 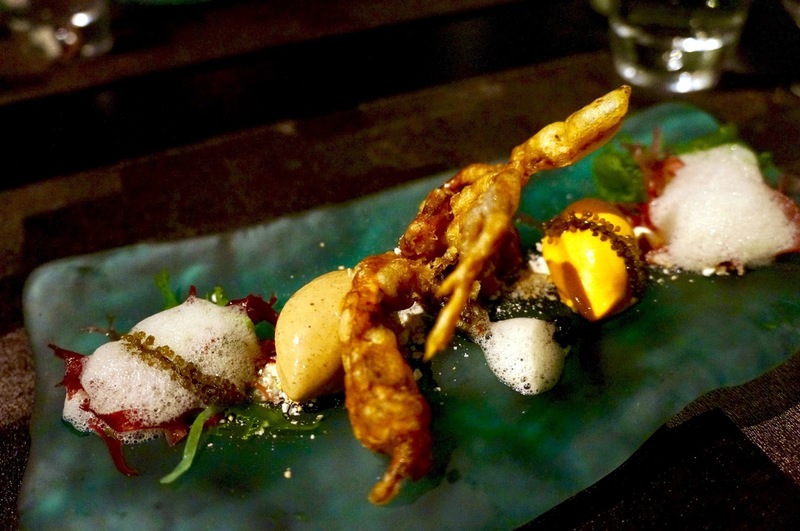 The menu showcases Singapore cuisine to the max and it extends the reach to visitors. Van has never tasted a ‘bak chor mee’ (minced pork noodles), yet she thoroughly enjoyed the silky squid noodles here. For me, it was surprise after surprise at the relatable flavours presented completely differently. The whole meal was playful and exciting, each dish came with a theatrical entrance and a remarkable little twist. A couple of courses might have been baffling in a less positive way, but the effort and originality is unquestionable.